COSTA RICA P167sct DATED 1931-36 2 COLONES, FAMED "MONA LISA !" CGC 66PQ FINEST KNOWN OF ONLY 3 TOTAL KNOWN / GRADED - BY ALL GRADING CO'S!!! 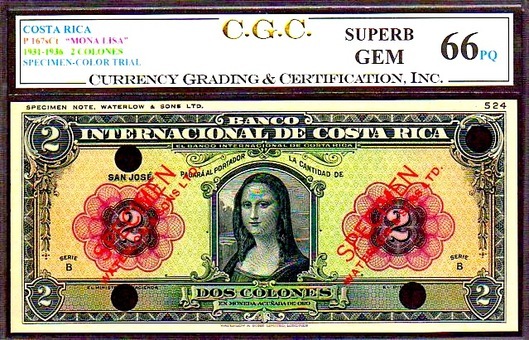 ALMOST ALL MONA LISA'S WE HAVE FOUND THROUGH EXTENSIVE RESEARCH ARE GRADED BY CGC - THE LEADER IN HIGH END WORLD PAPER MONEY GRADING! THIS PIECE IS A "SPECIMEN & COLOR TRIAL" IT'S A VERY SPECIAL AND RARE PIECE! AS ABOVE, THERE ARE ONLY 3 TOTAL GRADED BY ALL GRADING CO'S; AND RUMORED TO BE PERHAPS ANOTHER PIECE OR TWO OUT THERE (UNCONFIRMED HOWEVER). CERTAINLY DESTINED FOR THE FINEST OF COLLECTIONS!